HALIFAX men’s first team remain in relegation trouble in the Yorkshire Premier but took great heart from a 4-3 defeat away to high-flying Lindum. The home side must have been expecting a routine win but the plucky 11 men from Halifax put in a fine performance to keep the game tight until the end. Lindum started the quicker of the two sides, scoring two swift goals on the counter attack to justify their league position. 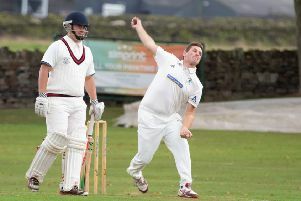 Halifax did not sit back and they responded with two excellent finishes from Michael Jones and Rob Amos. The second half was a very close affair and it was clear that neither side wanted to concede first. Chances were hard to come by but it was Lindum who struck first, taking the lead once more. Halifax, again on the back foot, needed a response and a wonderful reverse stick finish from Michael Broadbent looked to have earned them a valuable point. Luck was not on their side, though, and were aggrieved by umpiring decisions which led to Jones and Elliot Bullick being sin-binned. The pressure told and there was a late Lindum winner. Halifax will be hoping for a similar level of performance at home to second-placed derby rivals Bradford on Saturday. Halifax Ladies first slipped a place to fourth in Division Two South East of the North League after a goalless home draw with Sheffield University Bankers. They failed to find top gear in their clash with the fifth-placed side at Park Lane. The first half was a dull affair with few shots on goal. Emily Wilkinson almost broke the deadlock when put through against the keeper by a Lauren Vials pass. The second half saw opportunities at both ends. Following a rare attacking short corner Daniel Parker fired the ball towards the far post but the ball evaded a touch off a diving Emma Crawford. Bankers attacked quickly on the break and Amy March, on her return to first team action, was resolute on the right of defence. As Halifax continued to struggle to pass with any fluidity. Bankers almost stole the goal with a break down Halifax’s left. A tall striker sent a great undercut reverse stick hit which looked destined for the top corner before goal keeper and player of the match Cassie Barker stuck out a big right hand to deflect the ball to safety. It was an exciting end to a lack lustre match.